Find the ROOTof a word - end it with * (an asterisk). The question mark symbol ? is similar to the truncation symbol. Designate how close to each other you want your concepts - instead of AND use N# or W# where # can be from 1 to 50.
are used in the same manner. Limit Search to periodical articles or ERIC documents. a. The example below will retrieve only periodical articles. b. The example below will retrieve only peer reviewed periodical articles. c. The example below will retrieve only ERIC Documents. Document Number If you have the document number EJ###### or ED###### you can locate the citation in ERIC. ERIC - FINDING MORE USING TRUNCATION. Instead of searching for children - search for the root of the word child. This is done by adding the truncation symbol immediately after the root. ERIC - Limit the search to the title. ERIC - Find articles by a specific author. ERIC - Find articles from a specific journal or magazine. Assignments are frequently constructed suggesting that certain periodicals, journals or magazines would be more helpful than others. And, in your studies you may find particular periodicals more useful than others. 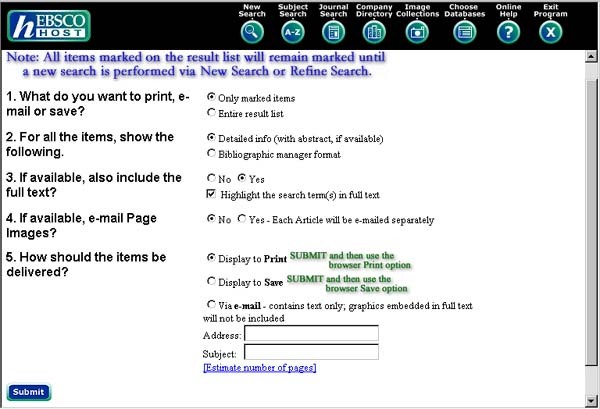 This search demonstrates how you can limit a search to a specific periodical, journal or magazine title. ERIC - Limit to Subject Terms (Descriptors). In the example shown both autism and mainstreaming are subject terms (descriptors). Every article and document in the ERIC database is described using a variety of subject terms (descriptors). Using these terms can increase the relevancy of article retrieved. Note - it will also reduce the number of articles retrieved. Subject terms (descriptors) are found in the descriptors section of the retrieved document. Click here to see an example of where they appear in the record. Terms in this section are used only after a lengthly review process. Subject terms with an asterisk are major subject headings - meaning the subject is of major importance in the article. In many cases articles/documents are also assigned Identifiers. Identifiers are used for terms in the field of education which are new and or not be as widely accepted as descriptors. ERIC - Limit to only Periodical Articles or Documents. For any number of reasons it may be necessary to limit your search to either Eric Documents or Eric Journal Articles. One of the most common is that a professor demands it. To avoid the frustration of finding documents you wish were articles use the limiting command. ERIC - Limit to Articles with Special Features. ERIC includes in its description of articles special descriptions to alert readers whether the article is a research article, a classroom guide, or heavy with statistics. You may also wish to consider the use of the target audience command. To store our research results please consider using RefWorks It not only stores your research results it will help you create correct citations. Take the word cat. Truncating cat to find cats would also get catfood, caterpillar, catalog -- a -- CATASTROPHE. The solution is to use the Wildcard symbol. This limits the truncation to one letter - in this case cats. The wildcard symbol can also be used internally: - wom? n finds woman and women. Click here or use your back button to return to the previous page. It was last updated on December 10 2012.